Textured paints offer matchless beauty and can provide substitute for missing texture in plaster. The textured paint finish is available in many color trends such as metallic finishes gold, silver and copper. Glossy and shiny finish of textured paint can also be obtained. These paints can be done on walls and ceiling easily and quickly. Textured paints of different colors are becoming popular for home/interior decoration and may be used an alternative to wall papers. Textured paints provide excellent protection against changes in atmosphere; withstand fairly well extremes of heat, cold and rain. These paints contain special additives which provide good protection against Alkali and ultra violet rays. The paints are extremely resistant to Fungs and Algae, peeling, flaking and fading and stay bright. Textured paints are thick enough to cover minor defects, uneven surface damage and imperfection in walls and add a fresh look to the beauty of walls/surfaces. Textured painting varies from slightly gritty look of sand stone or marble stone or wooden appearance and which can add deep look of the texture. Premixed textured paint available in the market can directly be applied on the surface. The premixed form of textured paint containing small, gravel like particles has grainy appearance. In this method acrylic latex paint is used; which bonds to the surface tightly and therefore lessens chances of loosening and falling down of texture paint. After surface preparation ‘Roller Painting’ should be done by skilled painter. 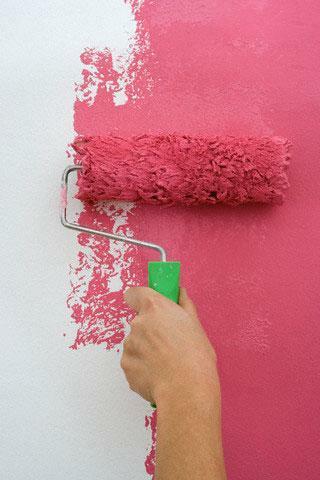 If unskilled painter is deputed on job, painting work may result in patchy and inconsistent work. It’s done as follows. Clean surface, roller and container before starting the painting work. Mix contents of the paint thoroughly before application. Dip roller in mixed paint and run it from top to bottom. Again dip roller and run it adjacent to the above applied area from bottom to top. Run roller without dipping it in paint horizontally and vertically on applied paint coat to spread it uniformly. How to do spray painting? 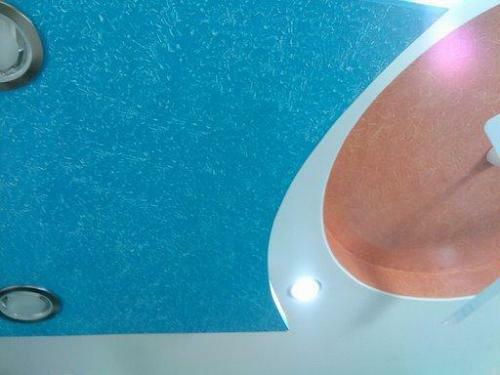 Spray painting is more popular method of textured painting and is specially done in textured painting of ceiling. The painter should be skilled enough to do the job. Spry painting is easy method and takes less time than rolling painting do. This painting is done through spray machine as follows. Clean the surface, spray machine and container before starting painting work. Mix contents of paint thoroughly before applying the paint. Add contents of paint thoroughly before application of paint. Do spray painting only when dry condition prevails. Hold spray gun perpendicular to the surface on which the paint is applied and move the gun over surface in a uniform sweeping motion while spraying. Try different air pressure and fan adjustment to achieve best application. Don’t keep air pressure high otherwise the paint will fog up and be wasted. Clean spray gun at the end of painting job. Take care if adequate ventilation is provided to disperse spray fume. Protect floors from spray fumes. Protects against Alkali and ultra violet rays. White (and its various forms such as off-white, beige, and eggshell) is popular and an all time favorite choice. It can be boring and too plain sometimes, but it also doesn't distract. It also makes a room look brighter and bigger. It's great for just about any room, especially bathrooms and kitchens. What are the various tips to choose the shades of paint? One of the biggest problems you face is -what looks to be "orange" on the sample in the store turns out to be "brown" on your wall. So it's really important to pick the right shade of paint by examining it under different sources of light. What are the various color schemes for bedroom ceiling? The ceiling is looked at more often in the bedroom than in any other room. Decorating this place is an excellent way to give your bedroom a complete and well-designed look. Which type of paint is best suitable for kitchen? The kitchen is a place that requires frequent cleaning and maintenance. So select the right kind of paint. Which type of paint is suitable for kids room? Which type of paint is best suitable for interior walls? Select latex /water based paints for interior walls because they do not fade away easily, less likely to crack or peel and have less odour .Moreover, latex paints are fast-drying and require only water for thinning and clean up. Which type of paint is best suitable for drawing room? Which type of paint is best suitable for bed room? Bedroom is a place where you spend the time for complete relaxation , so the type of paint and its finishing is essential factor if you want a neatly painted bedroom. What steps can be taken to increase the life of a paint job? What steps are recommended for painting a new construction? Surface preparation is 90 per cent of a painting job. Even the highest quality paint won’t adhere properly if the underlying surface is not prepared correctly. Good preparation requires the surface to be cleaned and smooth. What preliminary jobs should be done before painting a cemented wall (plastered wall)? Outdoor walls always take a beating from the wind, rain and changes in temperature, these results in cracks. They can be filled so that you can get your wall looking as good as new. What are decorative ideas for interior walls? What are the basic things that are needed while painting? What are the advantages of doing POP (Plaster of Paris) before painting? Plaster of Paris (Pop) provides a thin and smooth finishing to a plastered wall.It needs to be applied first to provide smoothness and a solid surface for the painting.